Whether you want to plan a first date to impress someone special or are looking for ideas on daytime adventures, we have you covered. Here are some recommendations on what to do together in Galway—with a match for every mood. The best first dates have a casual, breezy vibe that take any pressure off getting to know someone new. The Ard Bia restaurant at Nimmo’s strikes the right balance between casual and romantic, with its fun, colorful wallpaper and approachable menu. Don’t skip dessert here—a slice of dark chocolate torte with hazelnut praline might be the perfect finish to a first date. You can also start or end the evening at the on-site wine bar. Some of the best day dates get you out of your regular surroundings. Start the day with a drive to Rossaveal, a port west of Galway City Center, where you will board a ferry for the Aran Islands. Once docked at Inis Mor (or feel free to explore one of the smaller islands) rent a bicycle and set out for a day of exploration. 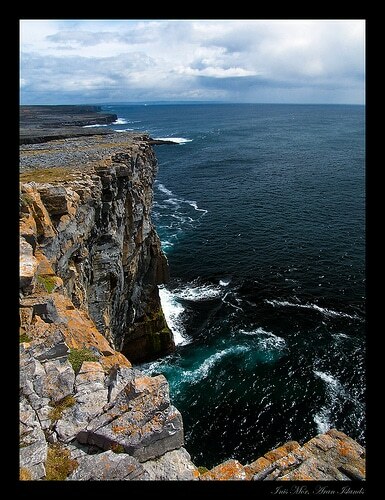 Hiking up to the top of Dun Aengus, a prehistoric fort overlooking a dramatic cliff, will be a highlight of the day. Give yourself time to enjoy a pint looking out at the harbor before boarding the ferry back to the mainland. If both you and your date don’t have a fear of heights, try something new together by signing up for a rock climbing class. Introductory classes will teach the basics on how to scale a rock face and how to abseil down safely. Half-day classes are available in Little Killary, about a 1 hour and 15mins drive north of Galway City. A company called Golden Moments operates these three-hour classes all year long. When planning a romantic date, keep two things in mind: a beautiful setting and an element of surprise. One place that provides both is Restaurant Gigi at the G Hotel. The brightly colored chairs, plush booths, and gilded mirrors take care of the beauty element. After dining on rack of lamb and wild mushroom tagliatelle, surprise your date with a key to a room upstairs in the stylish G Hotel. Breakfast is also included in the nightly rate per room.